Wed, 04/03/2015 - 08:00 Nicolas R.
From february 9th to 14th, Nicolas Rigaud, our developer advocate, and James Dietrich, our strategic partnership manager, were in San Francisco to attend Developer Week. This was the results of contacts made during JavaOne, back in September. Their agenda was pretty busy, but several events are worth mentionning. On Wednesday 11th, there was a special track about robotics at the Developer Week Expo. Aldebaran had a booth where James and Nicolas showcased NAO. 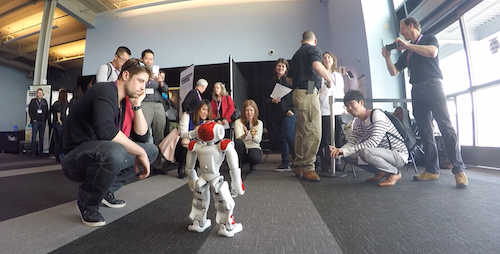 All day long, lots of people stopped by to interact with him, watch him dance and get more information about the way to program him. James and Nicolas also had a talk at 4pm to discuss the vision of Aldebaran about personal robotics.The feedback has been very positive and we hope it helped raising awareness about what we do. Lots of question came from the audience at the end, with a real interest for the business models that could be created with robots. On Tuesday 10th, Nicolas and James had an appointment at 6pm with Fabio Manzini (aka Atlas, who was visiting San Francisco on that same week) and Joseph Djunya (aka Djunya). The four of them drove from San Francisco to Sunnyvale to meet with the rest of the group: Jim Miller, Dan Moldovan, Kui Xu and Steve Chin (and his daughter). 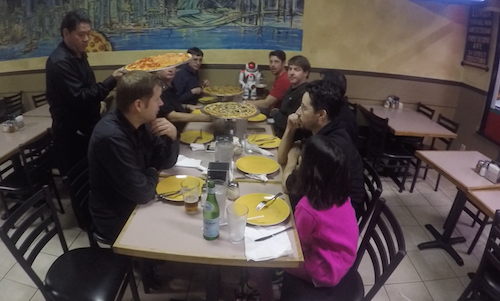 While sharing a pizza, it's been an opportunity for the new members (Djunya and Kui) to connect with old timers like Jim or Dan. Lots of conversations had to deal with NAO and Aldebaran, but not only. They all plan another meeting for next month, so feel free to let them know if you live in the Bay Area and feel like joining them. 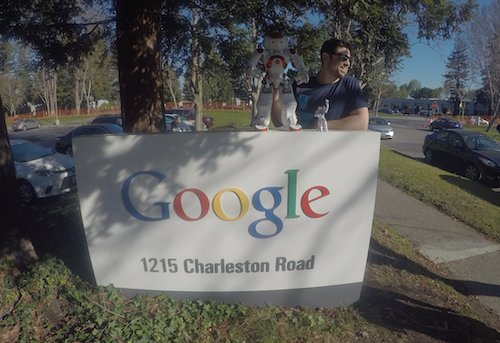 Jim Miller helped Nicolas and James set up an official talk at Google about NAO. On Friday 13th, they spent an hour presenting to about 30 people. Once again, there were lots of questions from the audience at the end. This time, more than the business models, it's really the use cases that interested them and the kind of real world problems personal robots could help solving. James and Nicolas also took advantage of being on the campus to hang around with NAO, which eventually ended in talking to some people and presenting NAO in a more casual way. 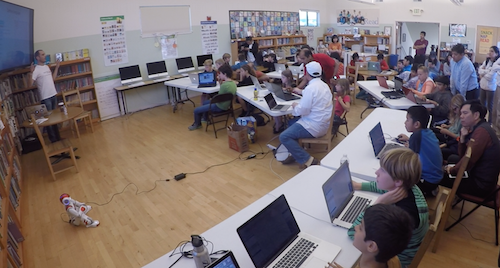 As you've seen in our previous article, James and Nicolas also worked with Arun Gupta in order to run a workshop to introduce kids to programming NAO. Silicon Valley Robotics event "Robots for Humanity"
SIlicon Valley Robotics tries to gather all people interested or involved in robotics. This event was divided into a networking event, for about an hour, followed by a talk by Henry Evans about his project "Robots for Humanity". Henri is quadriplegic, and he's been using robots of different kind to make his life a bit easier, and stay connected with his relatives. 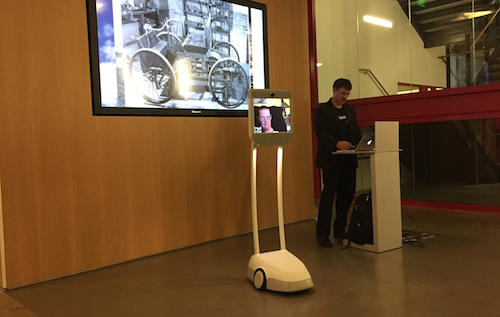 Henry Evans was not directly present but through a telepresence robot. We highly recommend you to watch his TEDx talk. As his family plans to visit Paris, we'll try to see if we can set up a visit for him at the Atelier.